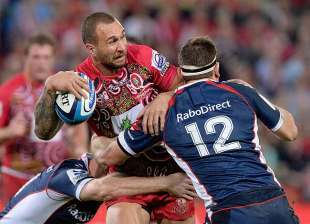 The stage has been set for Quade Cooper to showcase his skills in his final Wallabies audition. But Queensland Reds coaching director Ewen McKenzie appears resigned to Cooper missing a Wallabies call-back even if he receives rave reviews in Saturday night's tour clash with the British & Irish Lions. Wallabies coach Robbie Deans will attend the Suncorp Stadium match before unveiling his six additions to an initial 25-strong Wallabies squad on Tuesday week. And McKenzie has given Cooper the green light to throw caution to the wind in a bid to upset the Lions. However, McKenzie believed it may have no bearing on Cooper's Wallabies prospects. "I don't think anyone gets picked on one game," he said. "Quade has played every minute of every (Reds) game so I don't think he can actually do much more." Still, McKenzie will provide Cooper the perfect platform to show what the Wallabies may miss out on against the Lions. "You are not going to beat them playing an orthodox game. And someone like Quade, you can't get a better player to do that," McKenzie said. Cooper had an ideal chance to prove a point lining up against first-choice Wallabies No.10 James O'Connor but left with mixed reviews despite sparking Queensland's 33-20 Super Rugby weekend win over Melbourne Rebels. Twice Cooper's kicks were charged down to gift Melbourne tries, however, the Reds playmaker bounced back to pot over crunch penalty and conversion attempts before scoring the match-sealing try. McKenzie did not believe Cooper would lose much sleep over his Wallabies chances ahead of the Lions clash. "They've picked a squad, he's not in it at the moment," McKenzie said. "Whether he gets back in or not, that's someone else's call. But Quade plays the game because he loves it. He will get out there and do his best." McKenzie hoped the Reds could ambush the Lions after opening their tour with whirlwind trips to Hong Kong and Perth. "We are kind of hoping that by the time they get here they will be so busy organising themselves they won't pay too much attention to us and we might be able to do some good things on Saturday," he said. Meanwhile, McKenzie wouldn't bite after Rebels captain Scott Higginbotham appeared to question Beau Robinson's running style after dislocating his shoulder trying to tackle the Reds flanker last weekend. Higginbotham was cut from the Wallabies squad on Sunday due to the injury but remained confident he could play a part in the three-Test Lions series.